Osnatol stands for constant high quality in varnish and coating systems, high-grade raw materials and steady prices. We develop and produce high quality products, which have a good reputation in industry, artisanry and trade. Osnatol is adept in development and production high quality in varnish and coating systems for industry, artisanry and trade. As a medium-sized enterprise we develop, produce and supply high-quality products into a number of market sectors by enjoying a good reputation in industry, trade and commerce. In order to achieve customer satisfaction we pursue strong customer relations and constant exchange. 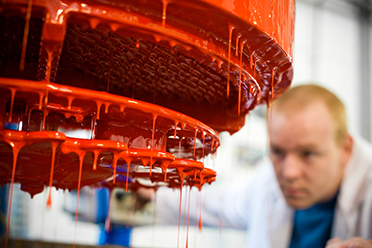 In addition to our broad range of products we offer to develop special coating solutions for requested individual customer applications. Thus we consider ecological guidelines as a measure of quality and safety.